Escape the office and have a team adventure! Looking for inspiration for a team building exercise? Need an energising activity for your away day? Want to celebrate an achievement with some fun and games? Whether you want to have a fast-paced urban adventure, use your problem solving skills to crack a museum mystery, or take on the roles of hard-boiled secret agents, Fire Hazard Games can create an unforgettable experience for you and your team. ...and if none of our existing options fit your needs, we can always discuss tailoring to your specifications, or designing something new! We have a number of different existing game options to suit your team and event, outlined below. Any questions? Email us at fire@fire-hazard.net or call +44 20 3322 7086. To discuss booking any of our existing options, email our sales manager, Michelle Hudson, at michelle@fire-hazard.net. Interested in a bespoke game design? Call Gwyn Morfey on 07717606828 or email him at gwyn@fire-hazard.net. Location - choose from a selection of existing London zones, or contact us to discuss bespoke options. Time - 2.5 hours (inc. briefing, game-play, and prize-giving), must be within museum opening hours. Location - London Bankside, or contact us to discuss bespoke options. The Fire Hazard City Dash was really well organised and executed. Everyone who took part loved it and it definitely brought out our competitive sides! Such a great idea that I would recommend to anyone looking for an exciting team event. Citydash is the best team building exercise, it’s fun, fast and challenging! It is harder than you think running around London, on the lookout for people chasing you, trying to work out where you are and solve clues at the same time. You get to really work as a team, perfect end to our training day and embodies our Run Happy culture. Everyone really enjoyed the game and thought it was very well thought out and organised, so a massive thumbs up from us. I thought you guys were very helpful from start to finish. It was great that you tailored the game to make sure everyone from the office could take part in some form, we didn’t get a bad review form a single person in the office. We were able to use Fire Hazard’s expertise and interactive website to run three Citydash games simultaneously across our major sites, while communicating the key messages around a major marketing campaign. Everyone that took part loved the experience. I used Fire-Hazard for a recent team building activity (Citydash) for 40 team members. Michelle was extremely helpful and explained the options available and booking process in simple terms. She was always on hand to answer my questions and offer advice. The activity itself was well organised and ran without a hitch. 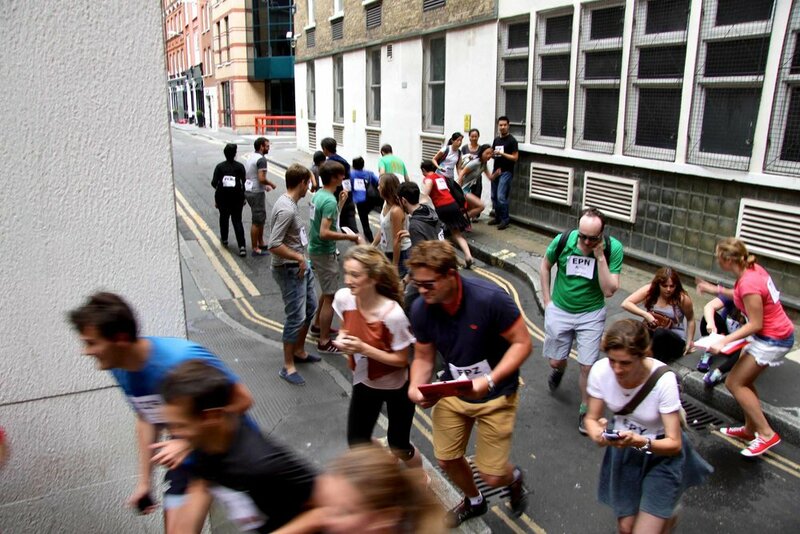 We organised an evening of Citydash for our team as a surprise - nobody knew what to expect. It was fantastically well-organised, and there was something for everyone: puzzle-solving, local history and moving fast! We were all looking out for the 'guards' even after we'd finished the game, and we're keen to play another one soon.